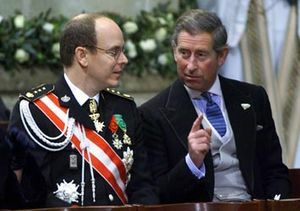 His Serene Highness Albert II, Prince of Monaco (on the left) represents a principality where he wields administrative power. His Royal Highness The Prince Charles, Prince of Wales represents a titular principality with no administrative power. Some have never been an actual polity, but simply a territorial denomination in chief of which a princely style is held, with or even without an often more modest estate and/or income, both of which may even be (at least partially) outside the geographical confines of the principality. Surviving sovereign principalities are Liechtenstein, Monaco, and the co-principality of Andorra. Extant royal primogenitures styled principality include Asturias (Spain), and Wales (UK). Notable principalities existed until the early 20th century in various regions of France, Germany and Italy. Though principalities existed in Antiquity, before the height of the Roman Empire, the modern principality as it is known today evolved into being in the Middle Ages between 350 and 1450 when feudalism was the primary economic system employed by Eurasian societies. Feudalism increased the power of local princes to govern the king's lands. As princes continued to gain more power over time, the authority of the king was diminished in many places. This led to political fragmentation and the king's lands were broken into mini-states led by princes and dukes who wielded absolute power over their small territories. This was especially prevalent in Europe, and particularly with the Princes of the Holy Roman Empire. During the period known as the Renaissance from 1200 to 1500, principalities were engaged in constant warfare with each other as royal houses asserted sovereignty over smaller principalities. These wars caused a great deal of instability and economies were destroyed. To add insult to injury, the bubonic plague reduced the power of principalities to survive independently. But eventually, agricultural successes, development of new goods and services to trade and patronization by the Roman Catholic Church boosted commerce between principalities. These states became wealthy and expanded their territories and improved the services provided to their citizens. Princes and dukes developed their lands, established new ports and chartered large thriving cities. Some took their new found wealth and built the first palaces and elaborate government offices people now associate with principalities. While some principalities prospered in their independence, less successful states were swallowed by stronger royal houses. Europe saw consolidation of small principalities into larger kingdoms and empires. This trend directly led to the creation of such states as Great Britain, France, Portugal, and Spain. Another form of consolidation was orchestrated in Italy during the Renaissance by the Medici family. A banking family from Florence, the Medici took control of governments in various Italian regions and even assumed the papacy. They then appointed family members to become princes and assured their protection by the Medici-controlled Vatican. Nationalism, the belief that the nation-state is the best vehicle to realize the aspirations of a people became popular in the late 19th century. Characteristic of nationalism is the preference for loyalty to the people instead of loyalty to monarchs. With this development, principalities fell out of favour. As a compromise, many principalities united with neighboring regions and adopted constitutional forms of government with the monarch as a mere figurehead while administration was left at the hands of elected parliaments. The trend after World War II was the abolition of various forms of monarchy like principalities and the creation of republican governments led by popularly elected presidents. Principalities where genealogical inheritance is replaced by succession in a religious office have existed in significant number in the Roman Catholic Church, in each case consisting of a feudal polity (often a former secular principality lato sensu, such as a lordship, countship...) held ex offico -the closest possible equivalent to hereditary succession- by a Prince of the church, styled more precisely according to his ecclesiastical rank, such as Prince-bishop, Prince-abbot and, especially as a form of crusader state, Grand Master. Principalities have existed in ancient and modern civilizations of Africa, Asia, Pre-Columbian America and Oceania. However in the colonial context, the term princely states is generally preferred, specially for those that came under the sway of a Western colonizing power, e.g. the British Indian and neighbouring or associated (e.g. Arabian) princely states were ruled by Monarchs called Princes by the British, regardless of the native styles, which could be equivalent to royal or even imperial rank in the autochthonous cultures. Several micronations, which claim sovereignty but are not recognized as states, also claim the status of sovereign principalities, the most notable in Europe being Sealand off the coast of England and Seborga, a small town in Italy; micronational principalities elsewhere include the Principality of Hutt River in Australia, the Principality of Minerva in the South Pacific. The Principalities are one of nine orders of angels in medieval angelology, the 7th in the hierarchy. A lunchtime conversational topic, which requires research and confirmation by a Lizbrarian. A fictional country, called The Principality of Belka, is one of the countries in the Ace Combat game series.